Calling oall investors & Developers. 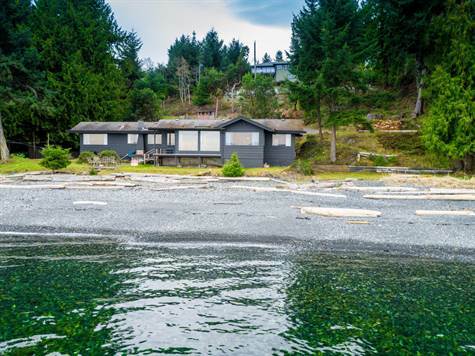 Two adjacent “walk on” waterfront lots in Nanoose Bay with a combined total of 173 feet of waterfront. The property presently has a very cozy and useable 3 bed/2 bathroom rancher with large double garage straddling both lots. Each lot already has it’s own separate titles. The home would have to be removed in order to develop the two lots. Exceptional access to the water along this sand and pebble beach frontage. Ideal for launching a kayak or canoe or small sailboat from this property. Seller has conceptual home plans available. Close location to the Fairwinds marina and golf course. The accessible walk on waterfront lots are a rare commodity in this general area. An excellent opportunity to build one exceptional residence on .55 acres or develop both properties individually. Enjoy the sought after waterfront life style along with all the wildlife you’ll experience.